Fabulous Resources – Check them out! Di d you know more than 95% of everything you do, think, or believe on a daily basis happens through your subconscious mind? Would you like to train your mind to think more constructively? Check out Scott Wilhite’s 7 Core Skills of Everyday Happiness . He can help you achieve lasting HAPPINESS through a simple 10-minute daily routine. 10 minutes a day. That’s it. You can totally do that. AFTER checking that out, here’s a free gift for you. 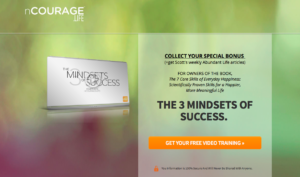 The 3 Mindsets of Success is a three-part series to help you clear out some of the mental cataracts that have been limiting your success and instead focus on getting yourself in the most effective mindset possible. Scott Wilhite, an award-winning commercial director and founder of nCOURAGE.LIFE shares the insights he gained from overcoming many of the limiting beliefs that were holding him back and gives many mental triggers you can use to be deliberate about choosing healthy thought patterns. Run time approx. 30 min for each video. Scott Wilhite is the creator of the Feed Your Happy app, the founder of nCOURAGE.LIFE, and the best-selling author of The 7 Core Skills of Everyday Happiness: Scientifically Proven Skills for a Happier, More Meaningful Life. But he wasn’t always happy. In fact, for years he considered himself a “tortured artist.” As an award-winning commercial filmmaker, he was enjoying ten of his most creative years without actually enjoying them. This all came to a head when anxiety, frustration, and built up dissatisfaction pushed him to unexpectedly quit his job. Fortunately, at the same time he learned about the Harvard-led research in positive psychology and found how simple it actually is to enjoy a life of peace and fulfillment when you train your mind deliberately. Once you learn happiness is a skill you’ll never go back to just wishing for it. Learn more about him and his systemized approach at nCOURAGE.LIFE.